Jews for a Secular Democracy » Why Do Religious Fundamentalists Believe That Their Religious Culture and the Political State Are One and the Same? At root, all fundamentalists of all religions find the modern world and its cosmopolitanism, diversity, and globalism extremely dislocating and threatens them with the loss of their world. This is because all fundamentalists live within nations that occupy geography that at one time was all about them and their kind, at least in their prevailing founding narrative. In the case of the United States, Christian fundamentalists have lived in a world where their kind have not only appeared the majority, but also in a world that, in their world view, “their kind” had founded. Think Plymouth Rock and Jamestown. Also dislocating to this largely Evangelical Protestant world view are the secular governance institutions throughout the West that are essential to the governing of modern pluralistic states that house increasingly cosmopolitan populations. In point of fact, since the essence of democracy is that it is an argument between or among differing points of view, the only way to govern is through institutions that are neutral to all of those points of view. In the United States, secular governance institutions have always managed the governing of the nation where these white Evangelical Protestants live, despite their being in the majority. But, since the boundaries of the land – America – where this majority Christian culture lives, are precisely the same as the boundaries of the constitutionally secular nation-state, the distinction between the country being Christian and the nation-state being secular is lost on many people embedded within their Christian world inside this nation state. So it is easy to conflate the two. The fact of secular governance troubles fundamentalist Christians greatly because they think that, since this country has a Christian majority, their world actually should encompass the governance realm as well. (Think here the prevalence of the idea of “majority rule”.) To them, the founding of the nation was at Plymouth Rock and/or Jamestown, not Philadelphia, where the blueprint for governance of the nation, the Constitution, was signed. (It is interesting to recall that when I was in public New England grade school, we read so much about the Pilgrims as the “first Americans” when studying the history of the United States. We also recited the Twenty-third Psalm along with the Pledge of Allegiance.) 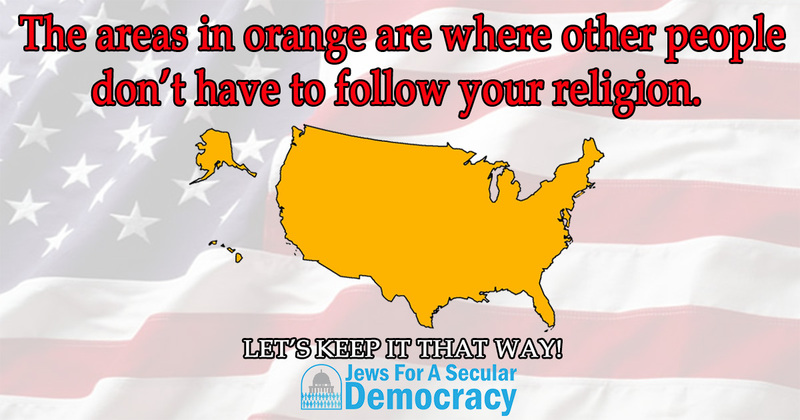 Despite the fact that the boundaries of the nation have housed a majority Protestant religious culture, and despite the fact that so many Americans over so many generations have only experienced the life of this country within a Christian world, the “country” is a Christian one only if you are referring to our secular nation-state’s majority culture, not to the state itself. Increasingly cosmopolitan modernity is threatening to the core identity of all religious fundamentalists everywhere, because this core identity is always rooted in an earlier time when their world — on the very same land that would later become the modern nation-state – appeared to feature almost entirely their same kind. (In the US, that meant of course ignoring Native Americans and later Africans, Jews, etc.) The most powerful adversaries of secular governance in the states in the modern world everywhere therefore are religious fundamentalists such as Evangelical Protestants in the U.S., strict Orthodox Jews in the modern state of Israel, Islamists in modern-day Turkey (which Ataturk had forged into a modern secular democratic state a century ago), highly conservative Buddhists in the states of S. E. Asia, highly conservative Hindus in the state of India, fundamentalist Sunni Islamists across much of the rest of the Muslim-majority states of the Middle East and North Africa, and fundamentalist Shi’a in Iran and across the Shi’a ruled crescent to the Mediterranean. We have also seen conflict between fundamentalist Protestants and Catholics in modern Northern Ireland. In every case the identity of these fundamentalists as “our kind” is tied to a piece of the world’s geography dating back prior to modern states — cf. white Protestant European early colonial America, Hindu India, Buddhist S.E. Asia, ancient Jewish Israel, the great sweep of the early Muslim Caliphate. In all these cases a particular religious culture held sway over a land — or at least the members of that majority religious culture felt absolutely that it did. Since this was a status apart from modern states, the sense that there was a coherent “peoplehood” to groups in these circumstances can only be described as a tribal one, the term “tribal” applying when communal life is based on common lineage or shared heritage or a shared belief tradition, something apart from membership in a political state. The fact that the core identity of all religious fundamentalists is at root a tribal one has powerful implications, one of them being that opposition to modernity (and its grounding in science and secular institutions) will be largely built in because governance through the institutions of a state will always be seen as alien, or infidel, etc. Major exceptions to this do occur, however, if a political state has a theocratic takeover, such as in Iran, or when the political state has a monarchy closely tied to a state religion that is also the religion of the great majority, like Saudi Arabia. As to how opposition by “tribal” fundamentalists to the constitutionally secular United States came to be, many Americans for much of the first century of our existence weren’t even aware that the new secular nation-state of the United States was actually a different order of thing from their “tribal” communal Protestant identity on the land — the “boundaries” of the two were exactly one and the same. And in so much of the country almost every other citizen the average person knew was still another one of “their kind” — a white Protestant. European with a name like Jones, Smith, Williams, Johnson, Miller, Brown, etc. (These are still the most common family names in our country.) It wasn’t until Irish Catholics began to come to this hugely Anglo-Protestant European America in the 1800’s that the idea that “America” was not just a white Protestant place even began to come into many people’s consciousness. And it was only then that the fact that the Constitution actually permitted this began to become the subject of dispute. It was also then that we saw the first reactions of WASP America to another white European and even Christian group as not “our kind”. This of course became the centerpiece of a wide hostile reaction to these “others” (“No Irish Need Apply”), revealing an early tribal reaction on the part of significant segments of WASP America. It was similar when newly independent and largely Hindu India had to contend with the fact of a large Muslim minority within the new Indian state, or the heavily Buddhist S.E. Asia states with their large Muslim minorities, or Israel with Palestinian Arabs within its borders – both those of 1948 and those more extended borders derived from an earlier “tribal”, pre-state, time. In every instance, the dominant religious-ethnic group asserted itself as the rightful citizens of the country, conveniently conflating the fact of being the dominant religion within the state with being the state itself. As long as we remained so heavily WASP, Church-State Separation did not rise much into most people’s consciousness. But when the “country” began to become more diverse and those with non-Protestant beliefs began to defend and champion Separation of Church and State, the core tribal identity emerged, manifested in a more militant fundamentalist Evangelical Protestantism. One direct — and ugly — expression of this a century ago was of course the Ku Klux Klan, which became very large in the 1920’s. The Klan was of course both exclusively and militantly Protestant. Since at root the claim of these fundamentalists — and what they feared losing — is the tribal claim that this is the land of “their kind” (cf., recent clearly tribal chants by white supremacists of “blood and soil”). This very same kind of tribal core identity rooted in a fundamentalist religion also manifests across the globe today as nationalism. And if one looks at nationalist movements around the world and through history, they are almost always grounded in an earlier very clearly tribal core identity, as when German and Italian fascists deliberately evoked the earlier, purer tribal identity as the “folk”, and the German fascists brought back older Teutonic tribal mythology, or some Muslims began to follow an older, very pre-modern, supposedly purist Islam of the Salafists, or Israeli settlers of Orthodox persuasion invoke Eretz (Biblical) Israel, and Evangelical Protestants try to bring back the King James Version of the Christian bible as the “true” and “original” Word of God, not commenting on the fact that this was yet another in a long line of translations. But since it happens to have been published in 1611, right before the time of the Protestant “founding” of (Christian) America at Plymouth or Jamestown, and since it is a document that gave coherence and identity to a group of people whose sense of their existence as a coherent collective was a tribal non-state one of shared heritage and belief, the King James bible was viewed as the “authentic word of God”. Invoking sacred texts, and/or legends of the “folk” and their tribal origin stories, is often a centerpiece of the ideologies of nationalist movements. For a great many, that Christian bible taken literally has taken precedence over the Constitution as the purported founding document for the country, or at least it has validated fundamentalist Christians in merely including the Constitution in a number of “Founding Documents”, because others of them do mention God. This is in fact true, just as it is also true that virtually all signers of the Constitution came from Christian backgrounds. But two things are much more fundamentally true: 1. Only one of these founding documents spells out the actual blueprint for this nation’s governance, and 2. even though they had both Christian backgrounds and even Christian identities, the Founders still had the sense to write a blueprint for governance that was entirely secular. They did this because they were steeped in the philosophy of statecraft, because they knew well the recent religious-based wars in Britain and Europe, because they had come out from under a monarchic state that had a single official religion, and because they further realized that the various colonies did not all favor the same version of the Christian religion. And finally, they knew that a government of, by, and for the people, could not favor one belief system over others.